Designer Carbon Materials Ltd is developing advanced nanomaterials for a range of applications, including energy harvesting, bio-sensing and quantum nanoelectronics. They are producing designer endohedral fullerene molecules with tailored electronic properties. Designer Carbon Materials Ltd is a spin-out company from the University of Oxford. It is based on research led by Dr Kyriakos Porfyrakis and his academic group of 9 researchers. They have developed technology for the scaled-up production of endohedral fullerenes. Our patented arc-reactor system can bring endohedral metallofullerene production to the gram-scale and beyond, faster and more efficiently than conventional arc reactors. 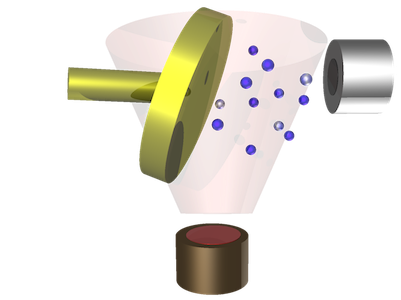 They have access to state-of-the-art facilities for the purification of a range of fullerene molecules, including endohedral metallofullerenes and endohedral nitrogen fullerenes. Endohedral fullerenes, also called endofullerenes, are fullerenes that have additional atoms, ions, or clusters enclosed within their inner spheres. The first lanthanum C60 complex was synthesized in 1985 and called La@C60. The @ (at sign) in the name reflects the notion of a small molecule trapped inside a shell. Two types of endohedral complexes exist: endohedral metallofullerenes and non-metal doped fullerenes. Nitrogen endohedral fullerenes is being used to create a small and portable atomic clock – the most accurate time-keeping system in the world – and could make the GPS navigation on driverless cars accurate to 1 millimeter. “At the moment, atomic clocks are room-sized,” said Lucius Cary, a director of the Oxford Technology SEIS fund, which now holds a minority stake. “This endohedral fullerene would make it work on a chip that could go into your mobile phone. Nitrogen atom is introduced into a fullerene cage. This endohedral fullerene is then coated with an insulating shell and a number of them are deposited as a thin layer on a silicon chip. Next to this layer a GMR sensor is fabricated which is close to the endohedral fullerenes. This GMR sensor measures oscillating magnetic fields on the order of micro-gauss from the nuclear spins varying at the frequency of the hyperfine transition (413 MHz frequency). Given the micron scale and simplicity of this system only a few transistors are needed to control the waveforms and to perform digital clocking. 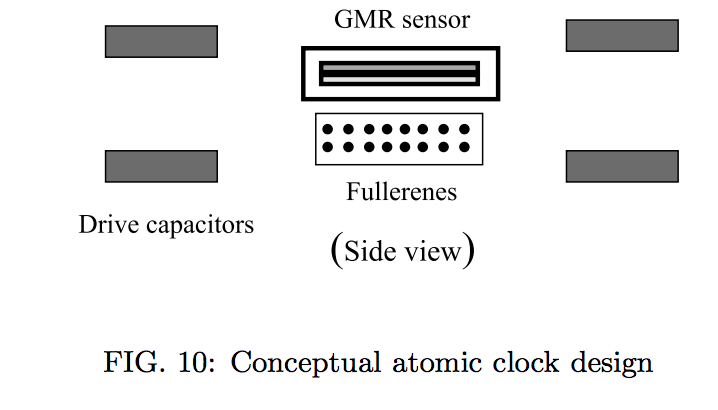 This new form of atomic clock exhibits extremely low power (nano watts), high vibration and shock resistance, stability on the order of 10^-9, and is compatible with MEMS fabrication and chip integration. As GMR sensors continue to improve in sensitivity the stability of this form of atomic clock will increase proportionately. The simple scheme discussed gives us a micron scale atomic clock with 10^−9 accuracy and a power dissipation of a nanowatt (10 nW capacitive drive but we can use resonant circuits to store the energy). This will likely be adequate for many mobile/sensor net applications but not adequate for more demanding situations. What can be done? First, as GMR sensors improve (BMR, etc. ), we can use more diluted fullerene stacks to gain a sharper line by a cubic factor in separation as we lose an equal amount of magnetic signal. A nanoscale-precise placing of fullerenes would give us a very well determined perturbation situation that can be exploited for accuracy. In the limit of true nanotechnology the ultimate clock is a single fullerene with considerable shielding. This should be competitive with very good atomic clocks of vastly more volume.